It’s here! After months of hard work, and plenty of help and support from our amazing web designer, Sole Graphics, we’re excited to announce the launch of our brand new website. The updated site includes changes to our menus, a mobile friendly navigation, and a newly revitalized blog. We’ve also worked hard to improve our content, meaning you don’t have to build an internest to read the whole site. When we started this project we had big ideas; update our messaging, include better photos, tell a better story. Above all, we wanted to make it easy for you to find the information you wanted – fast. Our solution was to split our content into three main sections. We now have ‘Donate to our cause’, ‘Explore our services’, and ‘Join our community’. 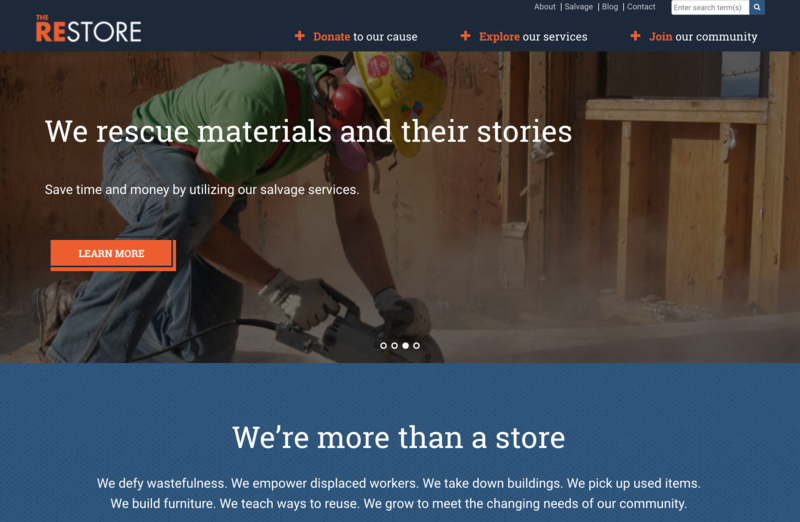 In our Donate section, we include information on how to donate your used building materials, a few hours of your time, or money to support our programs. In our Explore section, we make it easy for you to read about the different services we provide, from waste reduction to our efforts to combat single use culture. In our Join section, we share our events, explain ways to volunteer, and give thanks to our community partners. All of our other resources can now be found in the blog – from DIY resources, to RE Store Rockstars, and our latest sale manager special updates. We’ve also created easy to use contact forms, published a gallery’s worth of photos, and included a few updates that have made the site easier – and more enjoyable – to use. We hope you like the changes, and if you have any feedback, please let us know in our contact forms or on Facebook.